Imagination Light And Decor Pvt. 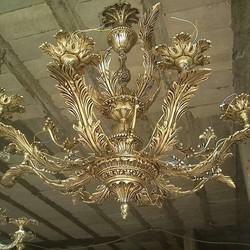 Ltd.
Brass Chandeliers and others designs in chandeliers are also available. We offer to our clients beautifully decorated Chandeliers, which are manufactured form solid brass and are available in antique Gold, Silver and other metal finishes. Further the innovative use of finest quality materials in its manufacturing helps in further enhancing the look of our products. Antique brass finish of this Vintage Brass Chandelier is designed with 26 lights and describes the creativity of the artisan and perfect production & quality control of our company. A modern chandelier for a broad and luxurious window section with a frame made of thin ribs of brass. The chandelier is pinned with long chains of octagons which gives the illusion of a cascade of small glittering raindrops. Modern Glass hanging with brass frame and as four crystal at bottom. The chandelier can be customised according to order. 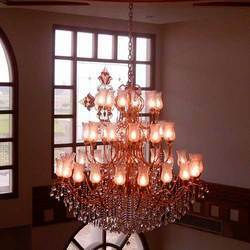 Supported ourselves with proficient amenities, we are readily instrumental in providing an inclusive variety of Decorative Brass Basket Chandelier.